As the saying goes, “a picture is worth a thousand words,” which makes a photo album priceless. Mary Kassmeier practiced midwifery in central Montana during the early 1900s, and through the years she collected photos of over 100 babies she delivered between 1915 and 1925. Because midwives didn’t generally sign birth certificates at this time, there is no way of knowing how many babies she actually delivered. 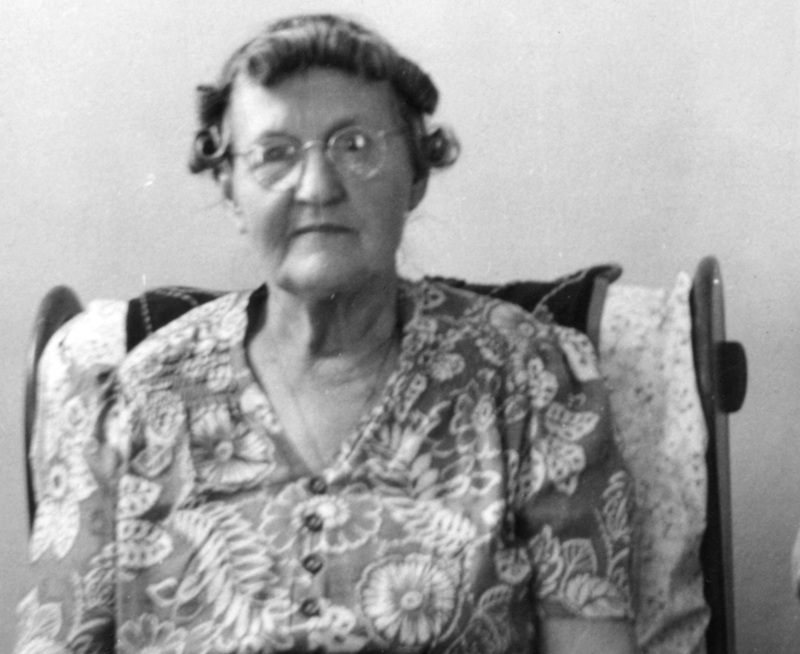 Historians believe there were more than 40 midwives who delivered babies in the Upper Missouri region in the early 1900s, but Mary is the only one known to keep this type of record. It’s likely Mary’s legacy would have slipped away had she not created this album. Mary C. (Reicks) Kassmeier was born on February 20, 1881 in Roselle, Iowa and was married to Henry Kassmeier at Howells, Nebraska in 1903. They moved shortly after their wedding to Belt where they homesteaded for about 10 years. They made their way southwest of Fort Benton where they lived until 1924. Together Mary and Henry had five children: Theresa, Rosie, Herman, Anna Marie, and Leonard. Leonard’s wife, Florence, recalls that around 1951 Mary brought out the photo album to show her daughter-in-law. Florence doesn’t know if she ever shared it with anyone before or after that. Mary explained the album to Florence saying, “These are the babies I helped bring into the world.” When Mary passed away, Florence collected the album and stored it in her basement until 2011 when she donated it to the Overholser Research Center in Fort Benton. According to Florence, Mary didn’t speak often about being a midwife, and she only recalled one story that Mary shared. Mary was home cooking breakfast when a car pulled up at her house. A husband and wife were on their way to Fort Benton while the wife was in labor, but they were unable to make it to town. Mary grabbed sheets from the house and threw them over the doors of the car to keep her children from watching the birth; then Mary helped deliver the baby in the car. The birth went smoothly, and the couple continued their drive to the hospital—with a new baby in tow. Records show Mary not only did home deliveries, but she also assisted in the deliveries of many babies at St. Clare’s Hospital in Fort Benton. Despite the national trend during this time, it appears doctors in this area collaborated with midwives like Mary. Likely because of the vastness of Montana and not having enough doctors to cover the area, doctors often sent midwives out to a delivery. Like other midwives, she often would stay post-delivery to help the mother with chores and taking care of the other children. If she was unable to stay, she would come back to check on the mother. It isn’t known if Mary apprenticed with another midwife or learned her skills on her own, but there are no records indicating any formal training, which was not uncommon for this time. Florence says she asked Mary how much she charged for a delivery, and Mary told her she didn’t charge anything, all she wanted was a picture of the baby. Some of the photos in the album are of older babies and toddlers, and Florence assumes some families were unable to afford a professional photo for several years before they were able to make good on their payment to Mary. When Mary passed in 1964, her obituary didn’t mention the work she did as a midwife, but thankfully the photo album lives on to tell her story. The photo album is available to view by appointment at the Overholser Research Center in Fort Benton. Dr. Jennifer Hill, a reproductive historian and a professor of American Studies at Montana State University, has spent significant time researching Mary and other midwives in this area. For more information, visit womensreproductivehistoryalliance.org/archives.